Independence Day in the United States of America is celebrated on the 4th of July. In honor of this important day in my country’s history, I’d like to take a look at some American-themed wristwatches you may have forgotten or never even knew about. These timepieces proudly wear their red, white, and blue! To mark the opening of the brand’s first boutique in the United States in 2011, Vacheron Constantin created a red, white, and blue-themed Overseas perpetual calendar chronograph with moon phase. This tribute to the United States of America was made in stainless steel and issued in an extremely limited edition of 20 pieces for the world. Long sold out, the Vacheron Constantin Overseas America could only be purchased through the New York boutique for a hefty $57,900. Hublot has made making special limited editions of its Big Bang to celebrate places, spaces, and events an integral part of its business. Released in 2011 in conjunction with the National Constitution Center in Philadelphia in honor of the Liberty Medal, which is awarded every year to men and women of courage and conviction striving to secure freedom for people around the globe, the Liberty Bang is crafted in black ceramic. The most obvious and most awesome aspect of the Liberty Bang is the black dial featuring text from the American constitution in an Old Glory scheme. Old Glory is a nickname for the American flag. The black dial features inspirational words of the United States’ founding fathers from the Constitution. The phrases were inscribed using innovative laser technology in red, white, and blue. 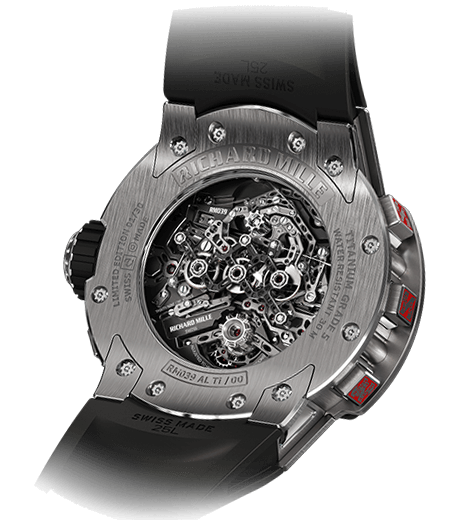 At the ceremony taking place on September 22, 2011 the honoree received the number 001 of the Hublot Liberty Bang edition in additional to the medal. Only 100 of these beauties were made, making the watch extremely sought after by patriotic timepiece collectors seeking American-themed watches. It is long sold out. Michael Kobold came to the U.S.A. from Germany to study at the prestigious Carnegie Melon University. Packed alongside his mementos from home, he brought with him a love of fine watches, an adventurous spirit, and an inherited sense of entrepreneurship. In the 19-year-old’s dorm room in 1998, Kobold Watch Co. (now renamed Kobold Expedition Tools) was born. Having fallen in love with America, he has set out to revive the glory of American watchmaking. The 2006 Spirit of America symbolizes all that. The Spirit of America line became the first Kobold timepiece to be entirely assembled in the United States. In fact, it was the first larger-series watch to be produced on American soil in 39 years. Then in 2007, Kobold brought out a highly limited watch that was called the Spirit of America Pop, whose dial was painted by pop artist and Pittsburgh native Burton Morris. 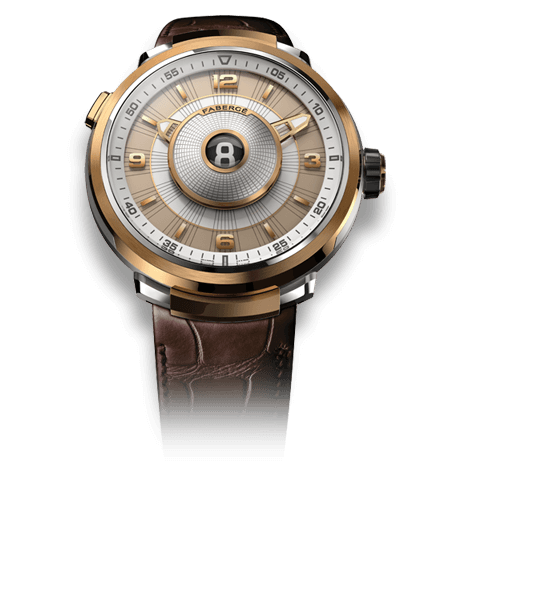 In 2008, Kobold followed up the popular hand-wound model with the Spirit of America Automatic, whose case was also entirely made in the U.S.A. and assembled in the Pennsylvania workshops. 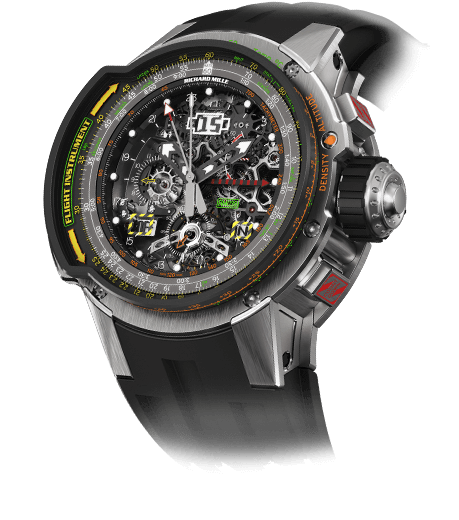 “It was the first serially produced watch with a 100 percent U.S.-made case in over a generation,” Kobold explained. 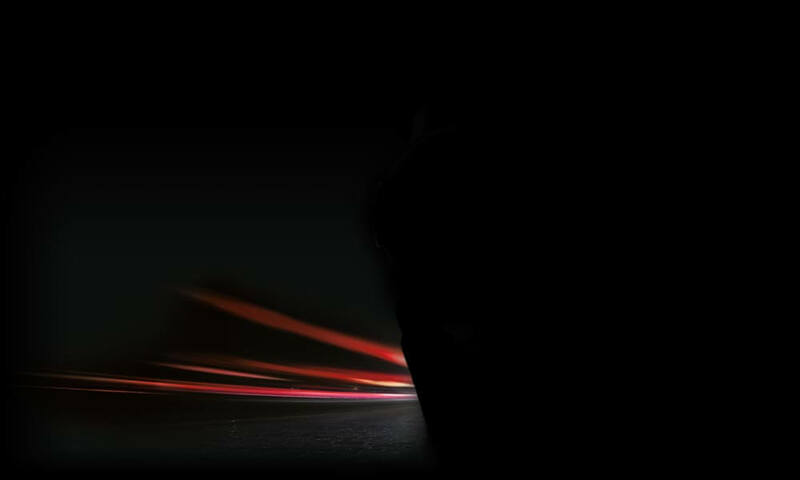 By 2008, 86 percent (by value) of the Spirit of America Automatic was manufactured in the United States. This is truly an American story. Case: stainless steel, 44 x 14 mm, 100% made in the U.S.A. This watch came out in 2001 and is the first patriotic timepiece that I can remember. 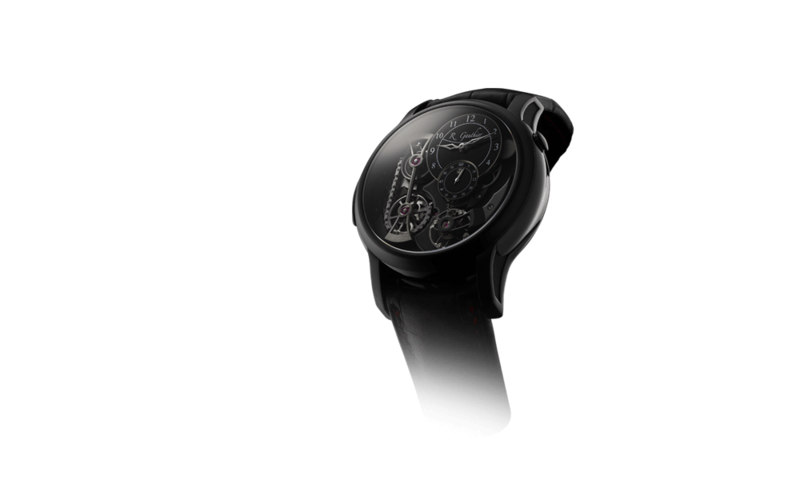 Like Kobold, its creator was a man of European descent: Severin Wunderman, Belgian owner of Corum from 2000 onward, lived in France, Switzerland, and the United States before his death in 2008. 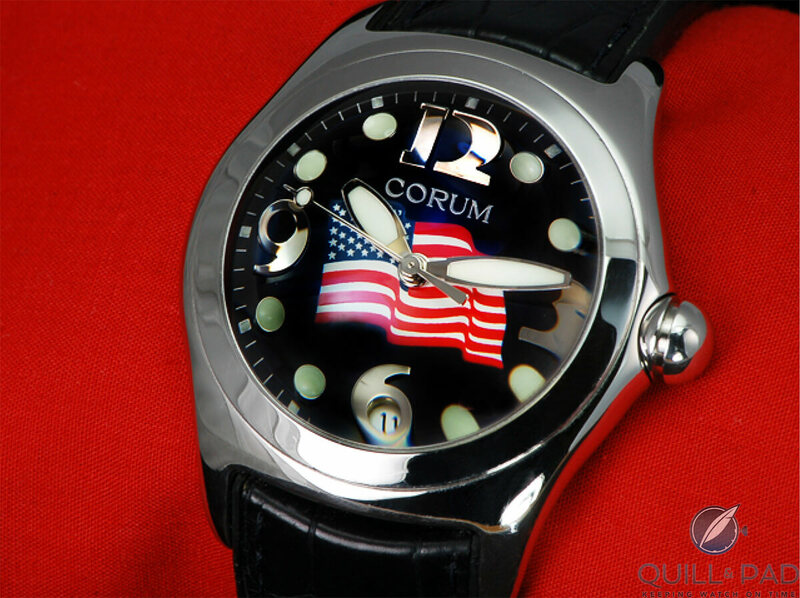 This was also the first limited edition from Corum’s Bubble collection, sparking the series that included the Jolly Roger, Joker, Night Flyer, Bomber, and a host of others. From my time in retail, and being one of Corum’s authorized retailers, I can report that this was always among the most desired pieces in the Corum collection by Bubble fanatics. When Franck Muller introduced the Long Island collection, I recall reading an interview in which Muller was asked, “Why the name Long lsland?” Being from Sayville on the south shore of Long Island and growing up on the amazing beaches of Fire Island, I was proud when he explained his fondness for my birthplace. Drumming up even more pride for me was when the brand introduced the America-America version of the collection. Thanks to that background and its beautiful dial stamped with a guilloche pattern and red, white (silver), and blue color scheme, this has always been my favorite Franck Muller timepiece.  The black DLC-coated stainless steel really allows the stars and stripes of the dial to pop out between the rotor slats like fireworks on the 4th of July. 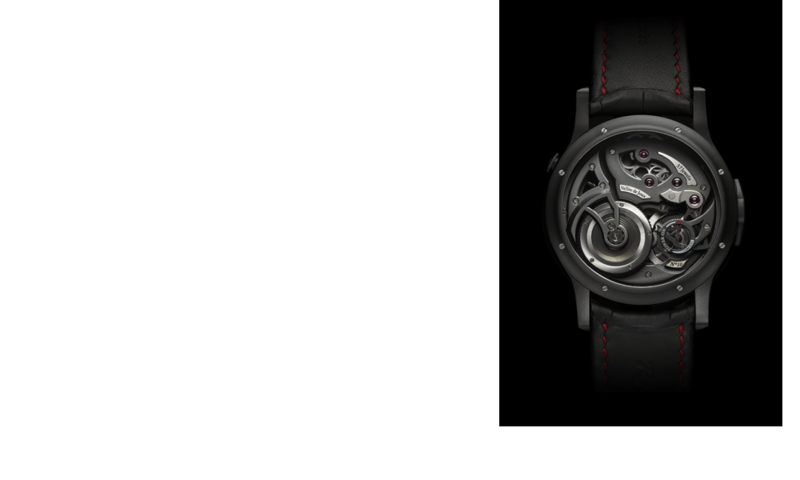 The black “turbine” (rotor) covering the dial is one of Perrelet’s signature double rotors. How much is the NY Vacheron worth now? Mine is engraved with the address of the New York Boutique as well. Hi, Steven. Value like that is hard to assess. The best way is for one to come up at auction or get sold on the secondary market. I haven’t seen one come up yet. Wow! Absolutely beautiful timepiece. Unfortunately, that’s not the ballpark I’m able to play in. What a work of art.